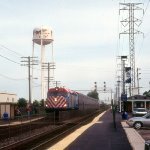 Title: METRA 604 @ Western Ave. Description: The F40C was a one of a kind model built for the Milwaukee commuter trains. It resembled an F40 on six axles, but was notable for the stainless steel panels on the side of the unit. 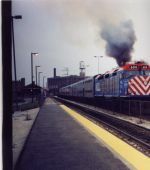 We see 604 on the north side of Union Station, waiting for departure. Description: Train 2709 performs station work. Description: Train 2709 departs the station.